Digital Drug. Binaural Beats Digital Drugs. Total Mind Buzz - A Natural High. Inebriated feeling, without the alcohol or headache! 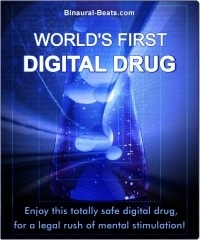 Using the Digital Drug MP3 couldn't be simpler! Like all our binaural beat recordings, simply slip on your stereo headphones and press the "Play" button on your MP3 player. The binaural beats will automatically begin affecting your brainwaves, and you'll soon realize the benefit - an ultra-happy mood and an increased confidence! You love the rush of a theme park roller coaster, or the true inner happiness experienced during a rare moment of love. Why can't these moments happen more often, you think? Why can't the world live like that all the time? With a "digital drug", you can touch those parts of your mind usually reserved for the momentary peaks of our existence. This is a totally legal, completely safe, non-addictive binaural beat recording that releases endorphins, the body's natural "happy pill", to bring about an elevated mood state. You simply slip on the headphones and relax. You feel soft and cosy. As the noises swish around inside your head, you gain a total sense of clarity and harmony. Your brain naturally generates and releases endorphins, enkephalins, endogenous opiates, and serotonin... your mood elevates, pain disappears, fears and anxieties are crushed. You steadily begin to realize your sensitivity has increased. Suddenly everything looks brighter and more beautiful. Why don't people usually see this? You feel like a famous movie director, with a very special lens on life. You're totally conscious with amazing clarity of mind. You feel a sense of euphoria. You close your eyes and can suddenly visualize anything you dream of. It's truly amazing. And it doesn't just last for your sixty minute session... this is a totally natural "high on life" digital drug, with the effects lasting for hours afterward... no sudden "drop down", no adverse effects. It's just a feel-great, total-mind state of happiness, pure and simple. "Felt so inspired, confident, and chilled all at the same time! ... This is definitely an amazing discovery. Thank you!"